Green Energy Congress 2019 would serve as an enlightening source for multidisciplinary area that monitors renewable Energy sources and systems, industrial applications, energy storage and network, Environmental impact, energy conservation, law, improved energy efficiency in buildings and latest trends and technologies for utilization of natural resources along with nanotechnology applications and energy solutions. 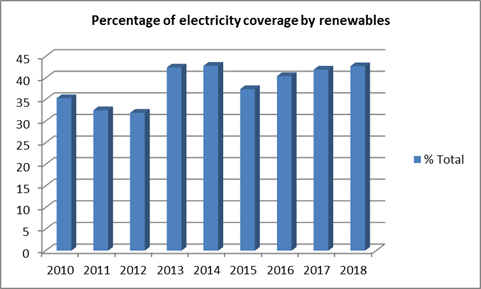 Electricity from renewable sources in Spain represented 42.8% of electricity demand coverage during 2014. The country has a very large wind power capability built up over many years and is one of the world leaders in wind power generation. 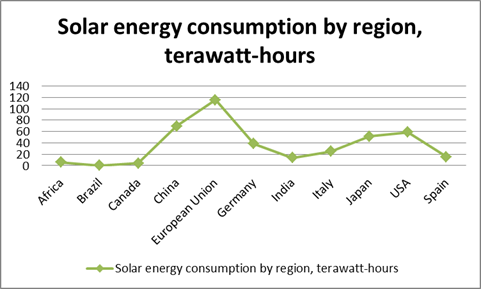 Initially Spain also positioned itself as a European leader in Solar power, by 2007-2010 the country was second only to Germany in installed capacity, however other countries (Italy in particular) have since leapfrogged Spanish development. By 2015 solar power in Spain though significant produced less than a third of that of wind power in 2015. Spain has set the target of generating 20% of all its energy needs from renewable energy sources by 2020 and an additional 0.8% may be available for other EU countries under the cooperation mechanism bringing the total to 20.8%. By the end of 2014 Spain had reached a level of 16.2% of all its energy needs from renewable energy sources. All EU countries as well as Iceland and Norway submitted National Renewable Energy Action Plans (NREAPs) to outline the steps taken, and projected progress by each country between 2010 and 2020 to meet the Renewable Energy Directive. Each plan contains a detailed breakdown of each country's current renewable energy usage and plans for future developments. 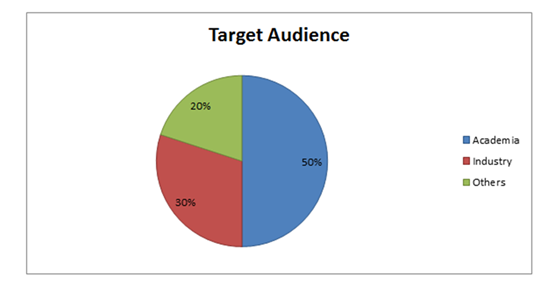 According to NREAP criteria around a third of energy consumption (32.5%) is used in the heating and cooling sector. The heating and cooling sector (also known as the thermal sector) includes domestic heating and air conditioning, industrial processes such as furnaces and any use of heat generally. The electricity sector and transport sector are also projected to account for around a third of energy consumption each at 33.6% and 33.9% respectively. The proportion of energy use in each sector is similar to that of 2016. In order to meet Spain’s overall target for 20% use of renewable energy (it was just 8.3% in 2005) in gross final energy consumption (20,505 ktoe) by 2020 targets have been set for each sector as follows: 17.3% renewable energy use in the heating and cooling sector, 39% in the electricity sector and 11.3% in the transport sector. Total annual energy consumption is projected to be 98,693 ktoe (98.7 million tonnes of oil equivalent) by 2020. The report expected Spain to produce a surplus of 0.8% above the 20% target (20.8% total) for renewable energy use which would be available for other countries to meet their renewable energy targets under the "cooperation mechanism". %age of total national electricity demand coverage by component renewable sources, Spain 2018. 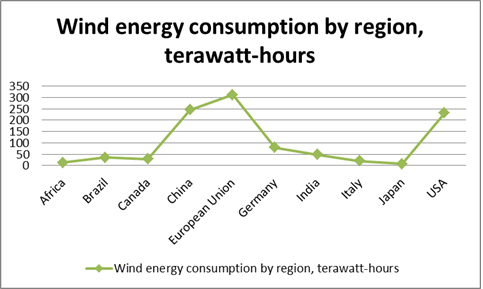 Wind power provided the largest share at 19.1% followed by hydroelectric power at 11.1%. Solar power provided 5.2% and renewable thermal a further 2%. The total electricity supplied (demand coverage) from renewables was 37.4% of Spain's requirements in 2018. Sharp variation from one year to the next is largely due to the substantial differences in hydroelectric production from one year to the next. Excluding hydroelectric production electricity generation from renewable energy sources grew from around 10 % in 2006 to 26.3 % of demand coverage in 2015. Most of the growth occurred in the years leading up to 2012 with little change in baseline capacity between 2012 and 2015. Renewable energy generated electricity had a record year in 2014 when it supplied 42.8% of Spain's national demand. 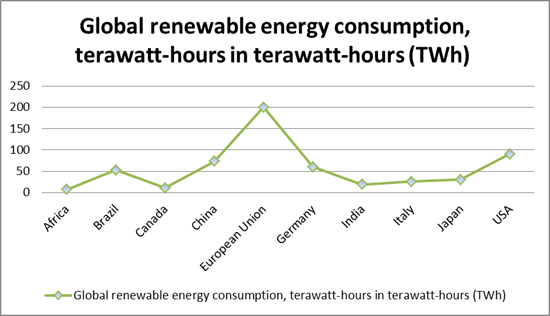 The visualisation below shows the global production of renewable energy over the long-term. As we see, historical production of renewable energy has been dominated by traditional biomass - the burning of wood, forestry materials and agricultural waste biomass. Although implemented at smaller scales for thousands of years, across a range of countries, hydropower output did not feature at large production scales with pumped storage development until the 1920s. Today, traditional biofuels remain the largest source of renewables, accounting for 60-70 % of the total. 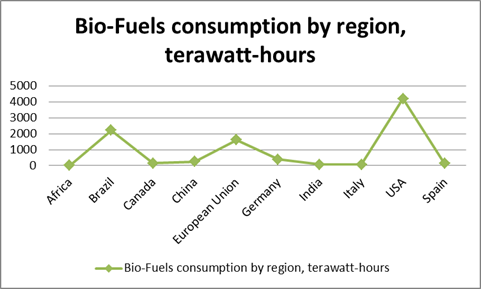 Traditional biomass remains the dominant fuel source for cooking & heating across many low-income households. The World Bank reports that only 7 % of the world's low-income households have access to clean fuels and technologies for cooking; the average share in Sub-Saharan Africa was 13 %; and approximately one-third in South Asia. Of the remaining renewable technologies, hydropower remains dominant, accounting for approximately one-quarter of renewable consumption. Hydroelectricity is electricity produced from hydropower. In 2015 hydropower generated 16.6% of the world's total electricity and 70% of all renewable electricity, and was expected to increase about 3.1% each year for the next 25 years. Hydropower is produced in 150 countries, with the Asia-Pacific region generating 33 % of global hydropower in 2013. China is the largest hydroelectricity producer, with 920 TWh of production in 2013, representing 16.9 % of domestic electricity use. The cost of hydroelectricity is relatively low, making it a competitive source of renewable electricity. The hydro station consumes no water, unlike coal or gas plants. The average cost of electricity from a hydro station larger than 10 megawatts is 3 to 5 U.S. cents per kilowatt-hour. With a dam and reservoir it is also a flexible source of electricity since the amount produced by the station can be changed up or down very quickly to adapt to changing energy demands. Once a hydroelectric complex is constructed, the project produces no direct waste, and in many cases, has a considerably lower output level of greenhouse gases than fossil fuel powered energy plants. Wind power is the use of air flow through wind turbines to mechanically power generators for electricity. Wind power, as an alternative to burning fossil fuels, is plentiful, renewable, widely distributed, clean, produces no greenhouse gas emissions during operation, consumes no water, and uses little land. The net effects on the environment are far less problematic than those of non-renewable power sources. Wind farms consist of many individual wind turbines, which are connected to the electric power transmission network. Onshore wind is an inexpensive source of electric power, competitive with or in many places cheaper than coal or gas plants. Offshore wind is steadier and stronger than on land and offshore farms have less visual impact, but construction and maintenance costs are considerably higher. Small onshore wind farms can feed some energy into the grid or provide electric power to isolated off-grid locations. As of 2018, there are over 200,000 wind turbines operating, with a total nameplate capacity of 432 GW worldwide. The European Union passed 100 GW nameplate capacities in September 2018, while the United States surpassed 75 GW in 2015 and China's grid connected capacity passed 145 GW in 2015. In 2015 wind power constituted 15.6% of all installed power generation capacity in the European Union and it generated around 11.4% of its power. World wind generation capacity more than quadrupled between 2000 and 2006, doubling about every 3 years. The United States pioneered wind farms and led the world in installed capacity in the 1980s and into the 1990s. In 1997 installed capacity in Germany surpassed the United States and led until once again overtaken by the United States in 2008. China has been rapidly expanding its wind installations in the late 2000s and passed the United States in 2010 to become the world leader. As of 2018, 83 countries around the world were using wind power on a commercial basis. New installations totalling more than 97 GW in 2018 took global solar PV power generating capacity to nearly 400 GW by year-end, a 32% increase versus the end of 2017. Capacity has nearly quadrupled in the past five years. The largest increments in 2018 were recorded in China (53 GW) and the US (11 GW), together accounting for two-thirds of the growth in global solar capacity. Japan provided the third largest addition (7 GW). China also leads in terms of cumulative installed capacity (130 GW), with one-third of the global total. The US (51 GW) and Japan (49 GW) are in second and third with Germany (42 GW) now in fourth. Solar power generation enjoyed another year of very rapid growth in 2015, with a 35% increase. Its overall share of global power generation remains low (1.7%), but that share has more doubled in just three years. Solar is starting to have a noticeable impact in terms of sources of power generation growth, contributing nearly 20% of the growth of global power in 2018. A biofuel is a fuel that is produced through contemporary biological processes, such as agriculture and anaerobic digestion, rather than a fuel produced by geological processes such as those involved in the formation of fossil fuels, such as coal and petroleum, from prehistoric biological matter. Biofuels can be derived directly from plants, or indirectly from agricultural, commercial, domestic, and/or industrial wastes. Renewable biofuels generally involve contemporary carbon fixation, such as those that occur in plants or microalgae through the process of photosynthesis. Other renewable biofuels are made through the use or conversion of biomass (referring to recently living organisms, most often referring to plants or plant-derived materials). This biomass can be converted to convenient energy-containing substances in three different ways: thermal conversion, chemical conversion, and biochemical conversion. This biomass conversion can result in fuel in solid, liquid, or gas form. This new biomass can also be used directly for biofuels. In 2018, worldwide biofuel production reached 105 billion liters (28 billion gallons US), up 17% from 2017, and biofuels provided 2.7% of the world's fuels for road transport. Global ethanol fuel production reached 86 billion liters (23 billion gallons US) in 2018, with the United States and Brazil as the world's top producers, accounting together for about 90% of global production. The world's largest biodiesel producer is the European Union, accounting for 53% of all biodiesel production in 2018. As of 2019, mandates for blending biofuels exist in 31 countries at the national level and in 29 states or provinces. The International Energy Agency has a goal for biofuels to meet more than a quarter of world demand for transportation fuels by 2050 to reduce dependence on petroleum and coal. The production of biofuels also led into a flourishing automotive industry, where by 2018, 79% of all cars produced in Brazil were made with a hybrid fuel system of bioethanol and gasoline. Shifting our energy systems away from fossil fuels towards renewable technologies will require significant financial investment. But how much are we really investing in the sector, and how is this finance distributed across the world? In the graph below we see global investments in renewable technologies from 2006 to 2018 (measured in billion USD per year). In 2006, the world invested 47 billion USD. By 2018, this had increased to 286 billion USD, an increase of more than 600 %. Investment has grown across all regions, but at significantly different rates. Note that you can use the 'absolute/relative' toggle on the chart below to compare regions on relative terms. Growth has been greatest in China, increasing from 3 billion USD in 2004 to 103 billion USD by 2018 (an increase of 3400%). China is now the largest single investor in renewable technologies, investing approximately the same as the United States, Europe and India combined. Combining Chinese and Indian investment with its neighbours, Asia & Oceania is the largest continental investor. Europe's investment has been through a significant growth-peak-reduction trend, peaking in 2011 at 123 billion USD before declining to 49 billion USD in 2018. Investment in the Middle East & Africa remains relatively small, but has shown significant growth over the last ten years (after investing only 0.5 billion USD in 2006). Levels of absolute investment tell an important story, but are disadvantaged by the fact that they take no account of the size of investments relative to a country's economy. We might expect that the largest economies would also be the largest investors. If we want to assess which countries are making a fair 'contribution' or 'share' to investment in clean energy, it is useful to assess investment contributions as a %age of a country's gross domestic product (GDP). We have calculated this (as a %age of GDP) and plotted it for the largest single-country investors in the second chart below. This tells a slightly different story. Most countries invest less than one % of GDP in renewable technologies (with the exception of South Africa and Chile, which make an impressive contribution at 1.4 %). When normalised to GDP, China remains one of the largest investors, at 0.9 %. Interestingly, despite being the second largest investor in absolute terms, the United States invested only 0.1 % of its GDP in 2018. Indeed, when it comes to relative contributors to renewable energy, low-to-middle income transitioning economies typically invest more than high-income nations. This may be partly explained by the fact that these nations are likely to be investing a higher %age of their GDP into energy provision and expansion overall (whereas high-income nations typically have well-established energy systems). Nonetheless, most high-income nations have set ambitious greenhouse gas reduction targets in their commitments to the Paris climate agreement.1 Achieving these targets will require significant investments in low-carbon technologies. 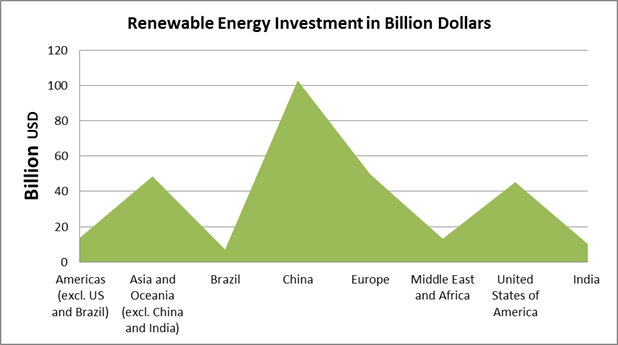 We have looked at investment trends by region, but which renewable technologies are receiving the largest investment? In the chart below we have shown global investment trends by energy source, through to 2018. 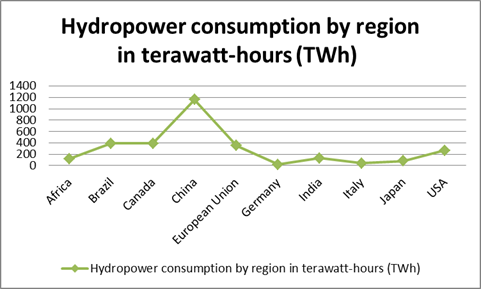 Note that large hydropower is not included in these figures. Again, you can switch between the 'absolute/relative' toggle to see comparisons in each. In 2018, solar and wind energy both received 47 % of investment (combining to account for 94 % of global finance). These two technologies have been taking an increasing share, especially over the last five years. In 2006, bioenergy (both in the form of biomass and liquid biofuels) took a sizable share of global investment, peaking at 36 %. This has dwindled over the last decade, receiving less than four % in 2018. These trends suggest that investors see solar and wind energy as the dominant renewable technologies of the future.